BOURNE, Mass. – A punch in the gut. That’s what it felt like for the Canton High boys hockey team on Thursday evening. The Bulldogs had just scored their third straight goal, erasing an early three-goal deficit to tie the game with just 1:53 left to in the third period. But just 14 seconds after Canton completed its comeback, Plymouth South senior Joey Van Winkle saw his slap shot somehow find its way through a crowd in front and into the back of the net. The Panthers added an empty-net goal in the final minute to notch a 5-3 victory in the D2 South Semifinals. The game couldn’t have started worse for the Bulldogs or any better for the third-seeded Panthers. Plymouth South scored on its first shot of the game, just 13 seconds into the game when defenseman Jack Worrick fired a shot that found its way between a defenseman’s legs and right into the top corner. The momentum stayed with the Panthers as they doubled the lead before a minute had expired on the game clock. A turnover in the neutral zone allowed South’s Sean Colbert to skate into the zone and his low wrist shot found its way in at the far post to make it 2-0. It looked as though Canton might be able to get one back quickly when Plymouth South was whistled for too many men on the ice, but even the power play couldn’t help the Bulldogs. Forty seconds into the man advantage, a miscommunication on a pass allowed South to skate out of its zone, coming down on a 2-on-1. Panthers senior Daniel Lincoln elected to shoot, hitting the crossbar and in for a 3-0 advantage. Though down 3-0 midway through the first period, the Bulldogs started to get their legs underneath them and started to plant the seeds of the comeback. The best chance in the first came with four minutes to play when Bubba McNeice tossed a pass in front that was deflected into the air. Senior Jack Goyetch got a good chunk of it by batting it out of the air but somehow South goalie Cam McPhee kept it out. The rebound found its way around before Mike Dadasis sent it in front again but McPhee covered the puck as Goyetch tried to bury it. The second period was completely different than the first as the Bulldogs dominated from the opening faceoff. Canton outshot South 16-1 in the fame, scoring a pair of goals to right back into the game. Despite having to kill a pair of power plays, the Dogs were on the front foot throughout. Shortly after a 21-second power play of their own, Canton finally got on the board. Junior Joe Robinson read a clearance attempt from the Panthers, knocking it down with his glove. He skated towards goal, and despite having his stick lifted, his was able to slide a pass over to sophomore Chris Lavoie who buried his chance from in close with 5:13 left in the second. Constant pressure in the offensive zone led to a tripping call on the Panthers, and Canton made sure to cash in. Junior Ryan Nolte picked up a loose puck after a face-off, skated towards behind the goal but dropped the puck off to sophomore Johnny Hagan. Hagan tossed the puck on goal, and despite having a tough angle, the puck hit off the post and in to bring Canton within one with 1:03 to go in the second. The third period was a bit more even with the early edge to South. But Canton continued to push to tie the game. Hagan had another tough angle shot bang off the crossbar just over three minutes into the frame. As the clock ticked under six minutes to play, Canton amped up its pressure. McNeice came flying into the zone only for his shot to whistle just wide of the post. And then with 1:53 to play, the Dogs scored their third. Sophomore Owen Lehane alertly pinched on a clearance attempt and then skated behind the goal to draw the attention of the defense. With all eyes on Lehane, he slid the puck through the crease to the waiting stick of Hagan, who roofed his shot to tie the game. Unfortunately, Plymouth South stole all of the momentum back just 14 seconds later. South gained possession down low, and as Canton’s defense collapse, the puck was sent back out to the defense and Van Winkle somehow got the puck to find its way through traffic. Canton finished with a 36-19 advantage in shots on goal but it could have been much higher. South’s defense blocked at least a dozen more attempts in front of McPhee. Canton boys hockey finishes the season 17-3-4. CANTON, Mass. – The fans were jammed into the Canton Ice House on Saturday night, not surprising since both Canton and Westwood call it home, with lines stretching out into the parking lot at game time and people filling not only the rink’s lot but the parking lots of businesses down the street. The massive crowd was expecting to see a close game between two contenders for the Div. 2 South title, a game that would go down to the wire. What the crowd got was a second straight dominating performance by the Bulldogs. Canton outshot the Wolverines 38-13, controlled play the full length of the ice, and were relentless in a 5-0 victory that moves the Bulldogs into the sectional semifinal. Canton has now scored 16 goals without reply in two playoff games and gave head coach Brian Shuman some bragging rights when he returns to his classroom at Westwood High on Monday morning. Special teams were critical for the Bulldogs on Saturday. Canton went 3-for-6 with the man advantage, including a pair of goals in the first period, and also killed off all four Westwood power play opportunities, while limiting the Wolverines to half-chances and long-range shots. The dominance began right from the opening face-off, as Canton came out skating hard and creating chances. Ryan Nolte had the first good look on goal skating across the slot onto his forehand but the shot was saved by Westwood goalie Justin Anderson (34 saves). With 7:26 remaining in the first, Canton broke the deadlock on the power play. Nolte was the first to a loose puck in the crease and he was able to knock it in for a 1-0 lead, Johnny Hagan and Timmy Kelleher picking up assists. Two minutes later, the lead was doubled as Bubba McNeice picked the top corner to Anderson’s blocker side. Westwood had one good scoring chance in the first when Tim Dalton drove hard at the net from the left side, but Gibbs kept his pad and stick in place to block the shot at the near post and it was cleared. Kelleher and Hagan both had good chances soon after but both narrowly missed the net. The Bulldogs went up a man with 21 seconds left in the first and quickly made the opportunity count. Nolte set up Hagan in the slot for a one-timer that gave Anderson no chance and gave Canton a 3-0 lead. The Bulldogs did not take their foot off the gas in the second period, although Anderson did his best to tap the brakes. The Westwood goalie made 12 saves in the second alone, denying Canton on a number of golden scoring chances. Mike Dadasis was fed in front by Jack Goyetch but Anderson made the point-blank save and he also stopped Hagan after the sophomore danced around several Westwood defensemen to get free for a shot. He then denied Nolte with a scrambling pad save on a shot from the edge of the crease and stopped Joe Robinson right in front. The Bulldogs finally ended any doubt on the power play with five minutes gone in the third period. Anderson stopped the first two shots but the puck squirted loose to McNeice on the far post and he took his time to roof the rebound for a 4-0 lead. With 3:29 left, Hagan slid in an empty net goal for his second of the night and third point. The goal wrapped up another convincing win for the second-seeded Bulldogs. 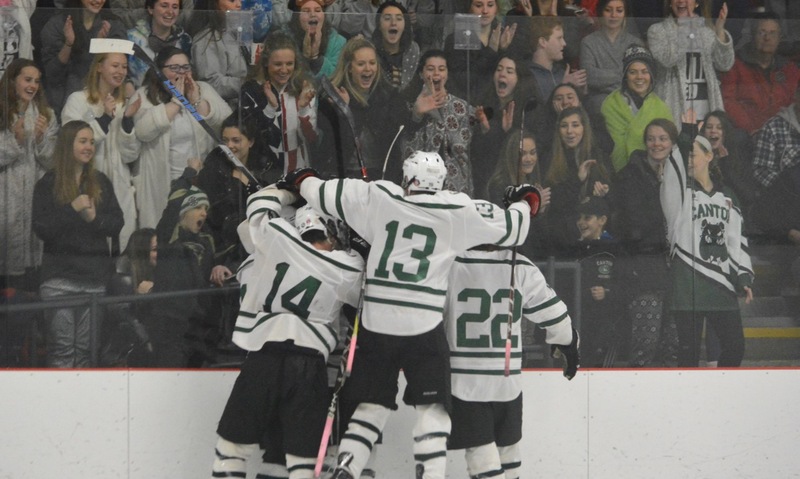 Canton (17-2-4) will face either Medway or Plymouth South on Wednesday at Gallo Arena. CANTON, Mass. – When the end of February rolls around, and March on the horizon, expectations in Canton are sky high. The Bulldogs have been the most successful team in the Division 2 South bracket over the past decade, reaching the semifinals nine times and the finals four times. Only one team made the finals more (Franklin) in that span but no one has been as consistent as the Bulldogs. With another playoff season upon us, the Bulldogs made a statement that they plan on making another deep run. #2 Canton dominated from start to finish, skating past D2 newcomer #15 Somerset-Berkley with an 11-0 decision. Canton scored a pair of goals in the first period but delivered the knockout blow with seven goals in the second period. The Bulldogs scored the first two goals of the period just 22 seconds in and then buried three goals in a period of 92 seconds later in the frame. But after those 10 minutes, Canton went on cruise control. Sophomore Owen Lehane finally broke the statement just over 10 minutes into the game. He took possession behind his own goal, skated the length of the ice and past the defense but had his bid in close denied. While the puck bounced around in front of goal, Lehane alertly got back into position at the blue line. The puck popped free onto the stick of the sophomore and he ripped a low shot through traffic to give Canton a 1-0 lead. The Dogs capitalized on the momentum, adding a second tally with under a minute to play. Off of an offensive zone faceoff, junior Ryan Nolte was the draw clean right back to sophomore Johnny Hagan. Hagan skated between the circles and fired a wicked wrister top shelf to make it 2-0. It didn’t take nearly as long for Canton to find the back of the net in the second period. Nolte won the opening draw back to Hagan who skated along the boards on the left side. He tossed a pass back in front to Nolte and the junior played the puck off of his skate and onto his backhand and flipped in his shot to make it 3-0. Nolte gained possession of the puck himself on the ensuing faceoff. After losing it briefly, he picked the puck back up again, circled into the center of the ice and rifled a wrist shot in for a 4-0 lead just 22 seconds into the second. Canton continued its offensive pressure with a fifth goal less than five minutes into the second. Sophomore Jack Connolly dumped a puck in, senior Jack Goyetch did well to keep possession, eventually getting it back to Connolly. The sophomore delivered a shot through traffic that senior Bubba McNeice got a tip on, making it 5-0 with 10:05 to play. The Bulldogs went on the power play for the first time in the game shortly after their fifth tally and cashed in late with the man advantage. After a lengthy possession in the offense zone, senior Matt Casamento to across the blue line to junior Brad Murphy. Murphy took his time, allowing the forwards to get possession in front of goal. Murphy then released his shot and Joe Robinson redirected it off the post and in to make it 6-0. 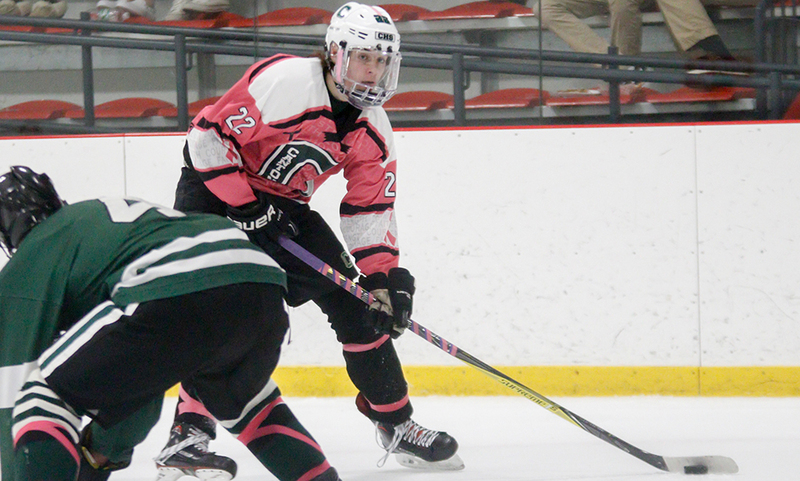 The offense continued to dominate for Canton, especially its top line of Hagan, Nolte and Timmy Kelleher. Just a minute over Robinson’s tally, Nick Allen dumped the puck in deep, Hagan touched it along to Nolte, Nolte lifted a pass in the air in front of goal and Kelleher batted it out of the air and into the net to make it 7-0. Off the ensuing face-off, Tommy Ghostlaw won it back to Murphy, who connected up ice to Chris Lavoie. Lavoie skated to his left and fired a wrist shot to make it 8-0. Less than two minutes later, Goyetch found the back of the net himself to make it 9-0 with 4:42 left in the period. In the third period, Charlie O’Connor and Ryan Colby set up Kevin Murphy on the right side, and the senior drilled his shot off the post and in. The Dogs added a final goal when Colby tipped in a shot off the stick of senior Brian Ghostlaw. Bulldog senior Quinn Gibbs made one save in two periods of play while senior Niko Donovan turned away two chances in the third period. Canton boys hockey advance to the D2 South Quarterfinals and will take on either #7 Westwood or #10 Oliver Ames. The Dogs are familiar with both teams, sharing a home rink with the Wolverines while splitting the season series with the Tigers. The game is scheduled for Saturday with the time and location to be determined. RAYNHAM, Mass. – For the fourth straight year, Canton found itself in the final of the annual Joseph I. Quinn Memorial Tournament at the Raynham IcePlex, but the Bulldogs also found themselves down a goal to the host team, Coyle & Cassidy, heading into the third period. Junior forward Ryan Nolte scored 21 seconds into the third to tie the game and then he popped up with just 54 seconds left on the clock with the tournament-winning goal, handing Canton a 3-2 win, its third Quinn Tournament title in the last four seasons, and a chance at the top seed in Div. 2 South. The Bulldogs got off to a perfect start to the game. Nick Allen’s shot from the blue line was kicked aside but right to the stick of forward Timmy Kelleher. The sophomore knocked in the rebound for a 1-0 lead just 34 seconds into the game. 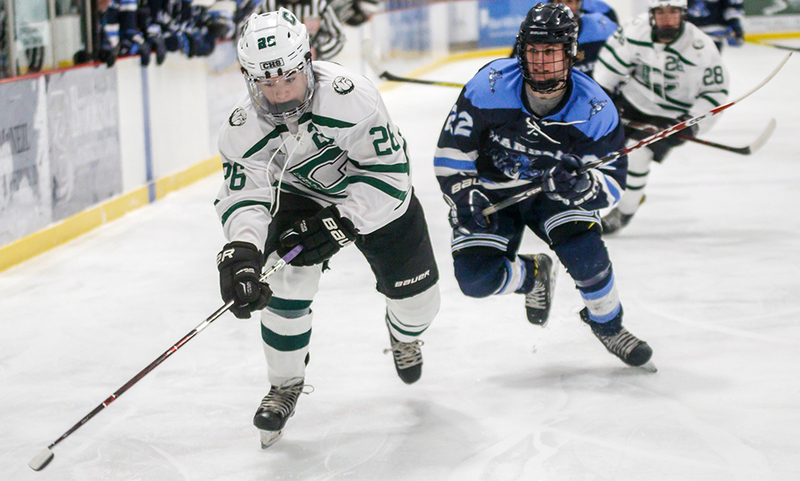 While Canton got the early strike, Coyle did not allow the Bulldogs to control the game, quickly regaining the momentum in what turned out to be an evenly played period that did not feature many clear-cut scoring chances. Kevin Murphy and Jack Goyetch each had shots on target midway through the first, Murphy from the slot and then Goyetch following up the rebound, but both shots were turned aside. With 1:17 left in the first, Coyle finally connected on a long outlet pass, catching the Canton defensemen wide and pushed forward, and Drew Arpin made it count with a five-hole finish on goalie Quinn Gibbs. Canton came out of the gates on fire in the second period, despite having to kill off an early penalty. Shorthanded, Nolte created havoc on the forecheck and forced a turnover that he nearly put away with a wraparound chance and then John Hagan was denied as he got to the rebound. Five minutes into the second, with Canton clearly in control of play, the Bulldogs made a mistake trying to clear the puck out of the defensive zone. It hit Jacob Ducharme on the leg and he was able to step forward clean through on goal. His backhand effort slipped under Gibbs for a Coyle lead against the run of play. Canton had plenty of chances to tie the game in the second, outshooting Coyle 15-2. Sophomore Chris Lavoie had a shot from the left circle tipped just past the top corner and into the netting and Nolte took a shot from the same spot on a 3-on-1 break that was comfortably saved. Despite dominating play in the period, the Bulldogs went into the third down by a goal. Starting the third with a power play, the Bulldogs wasted no time in getting level. Hagan had the first chance on the edge of the crease but the puck was blocked right to Nolte at the far post and he roofed his close-range shot to make it 2-2 just 21 seconds into the third. The game settled into a similar pattern with Coyle trying to sneak players behind the aggressive back line of the Bulldogs, but the defenseman continuing to make plays to keep the Warriors from getting off shots. Jack Connolly, Owen Lehane, Matt Casamento, Charlie Malloy, Brad Murphy, and Allen all made big plays to stop Coyle in the neutral zone or at least keep the Warriors from getting a clean look. Gibbs faced only three shots in the final 30 minutes of the game. Malloy also had one of Canton’s best chances in the third with a blast from the point that was saved to the corner. Charlie O’Connor also had a couple of chances but multiple times hit the side of the net in the third. Allen had Canton’s best chance after he stepped up into the attack with Kelleher and Hagan, but his one-timer missed the net by inches. Just seconds after Hagan saw a shot that looked destined for the top corner gloved to the back boards, Nolte again found himself in a battle on the edge of the crease and managed to find the back of the net with the go-ahead goal. It was the second time in the past three games that Canton had scored a game-winner in the final minute, a trait that could be the difference between a potential tournament run and an actual one. Canton (15-2-4) will wait for the result of a coin toss to see if it ends up with the top seed in Div. 2 South. CANTON, Mass. – Holding a 2-1 lead with under five minutes to go, the Canton boys hockey team was whistled for too many men on the ice. It was just the second penalty of the game for the Dogs, but the visiting Panthers of Franklin High needed just 20 seconds in the second period on their first chance of the man advantage to cash in. With the game on the line, Canton’s penalty showed it had learned its lesson from earlier on, coming up with a near perfect kill. The Bulldogs went on to score just over a minute after killing the penalty, and again with the net empty, to earn a 4-1 win in a clash of Davenport and Kelley-Rex division champions. Franklin needed just seconds on its first power play of the game with senior Brendan O’Rielly finding classmate Luke Downie at the back door for a simple one-timer. The goal had tied the game at 1-1 early in the second period. This time around, Canton didn’t even let the Panthers have a sniff at a scoring chance. Matt Casamento blocked an early chance, leading to a clear from Hagan. When Franklin attempted to bring it back in, Casamento forced the puck loose with a hit and Charlie Malloy came in and made the clear. Franklin had its lone shot of the power play up next but Quinn Gibbs (20 saves) made the save right into his chest. From there, McNeice had a pair of clearance, the latter helped along by a nice stick lift from Nick Allen. Shortly after the penalty was killed, Canton’s Timmy Kelleher linked up with Nolte, but his backhand attempt was just wide. Nolte then returned the favor, finding the sophomore in front for a one-timer but Franklin goalie Owen Ginley (31 saves) made a point-blank save. With Franklin pushing numbers trying to find an equalizer, Canton was able to take advantage of a mistake in the neutral zone. McNeice jumped on a loose puck a Franklin defenseman couldn’t handle, skated in on a breakaway and roofed his shot to make it 3-1 with 1:19 to play. McNeice added an empty-net goal in the final seconds to put an exclamation point on the win. While Canton had the strong finish to the game, Franklin was the team that came out on the front foot. The Panthers’ speed caused problems for the Bulldogs and the visitors had a lead in shots until the final few minutes. Franklin’s best chance of the opening period came when senior Kenny Demerchant took a pass against the grain, catching the defense going the opposite way. That allowed him to skate in alone but Gibbs came up with the pad save on Demerchant’s tough angle bid. Canton picked up some momentum at the end of the period when Franklin was called for tripping with 1:09 left. Ginley stopped a shot from Allen, and then a follow-up chance from McNeice. And then Owen Lehane had his shot stopped and Dadasis saw his rebound chance blocked. The power play carried over into the second period, and the Bulldogs needed just 13 seconds to convert. After winning the opening faceoff, Kelleher linked up with Hagan in front of goal, and the sophomore used his backhand to go upstairs to beat Ginley for a 1-0 lead. Franklin tied the game exactly four minutes later, just 20 seconds into their first power play chance. With the rest of the period playing out equally, Canton grabbed the momentum back with four minutes to go. Nolte had a chance at the right post but went just wide. On the ensuing scrum in front, Kelleher was able to get his stick onto the puck and into the back of the net to make it 2-1. 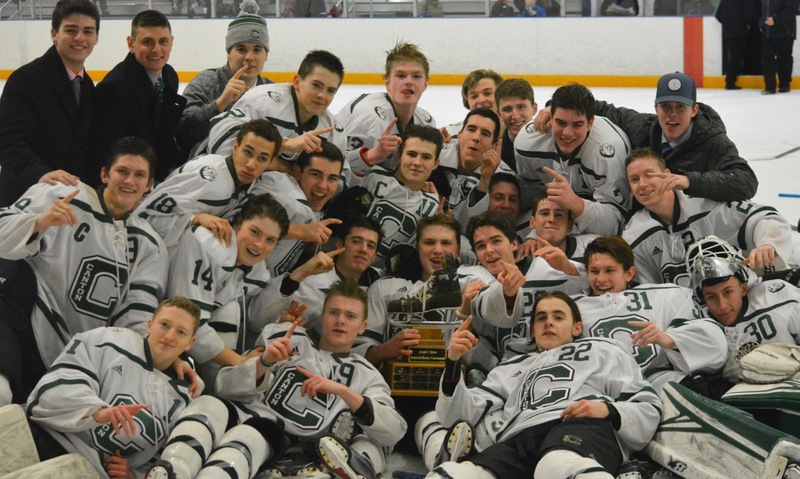 A win for Canton boys hockey (8-0-0 Hockomock, 11-1-4 overall) meant avenging its lone loss in regulation this season. The Bulldogs fell to Franklin earlier this season in the second game of the season in a non-league clash. Not only was it their lone loss in regulation, it was just one of three games they had allowed two or more goals in three periods of play. That, on top of senior, with bragging rights between division champs on the line, resulted in a spirited effort from the home side. Franklin (12-3-3) dropped its second straight game after falling to Hingham 6-2 earlier this week. Canton is back in action on Saturday when it takes on Oliver Ames at Warrior Ice Arena at 8:00 while Franklin returns to action on Valentine’s Day for a date with St. John’s Shrewsbury at 6:00. CANTON, Mass. – Even on a night with plenty to celebrate for himself, Canton head coach Brian Shuman made sure the focus was on something much bigger. The Bulldogs scored once in the second and two straight in the third to earn a 3-1 decision over Mansfield, marking Shuman’s 200th career win. While the timing of Shuman’s 200th win and Saturday night’s “Hockey Fights Cancer” doubleheader was coincidental, it was only fitting that the big milestone came on a night that Shuman helped organized to benefit others. Canton and Mansfield followed a clash between Xaverian and Malden Catholic, a doubleheader that raised money for the Dana Farber Cancer Institute in memory of Reo Todesca, mother of Xaverian assistant Paul Todesca and a beloved friend to many in the Canton hockey community. Canton’s list of accolades on the ice, including numerous Hockomock titles, dozens of playoff wins and a state championship in 2010, is just about as long as the amount of charity work Shuman and his Bulldogs are apart of off the ice. There’s the annual Boston Marathon Jimmy Fund Walk every September that Shuman and his Bulldogs walk in to benefit The Jimmy Fund. And there’s the annual Evening of Hope Gala that Shuman helps organize with his wife Tara. And Shuman and the Bulldogs spend plenty of time on the ice with the Bear Cubs Hockey program, which team chairman Matty Marcone is apart of. And who could forget two years ago when Shuman, along with Stoughton coach Dan Mark, worked to get Marcone on the ice of a varsity game. The list goes on and on, which is why it’s so fitting that Shuman reached the milestone while helping raise money to fight cancer. And of course, Shuman was quick to deflect credit away from himself and to the program for getting to 200 wins in just 13 years. The visitors came out strong in the first period, having an edge in time of possession and attacking zone time. The Hornets also had a pair of power play opportunities, the first after a Canton cross-check with 11:17 left in the opening period, and again after a roughing call with 6:17 to go. But out of those two man-advantage situations, the only real threat came late in the second one when freshman Matt Copponi went to circle the net but dropped a pass right in front of goal instead to his brother Chris Copponi, but the elder brother was unable to get the puck past Canton goalie Quinn Gibbs. The Bulldogs came out flying in the second period and dominated the second period. Mansfield was able to kill off a cross-checking penalty but Canton was able to cash in a minute later. Junior Ryan Nolte connected a pass to sophomore Johnny Hagan, who lifted his backhand attempt top shelf to give the Dogs a 1-0 lead. “I thought that first period, that was probably the most we have been outplayed in a period all year long,” Shuman said. “Mansfield has a good team, they play hard, they work hard, they have a great system and they are very, very well coached. I think the breakout for us was everything in the first period. I think the breakout sets the tone for so much of our offense and the flow of the game, and we could not break the puck out of the zone, we struggled in all facets of the breakout. Give credit to Mansfield, they made it hard for us. Canton had two more power play chances, including a brief 5-on-3 chance with just over three minutes to go, but the Dogs couldn’t add to their lead. Mansfield’s best chance came when the Hornets killed off their third penalty. Senior Adam Anastos came out of the box, took a feed from Cullin Anastaia as he entered the zone, and then center a pass back to Anastasia but his tip effort sailed just wide of the post. “I’m not sure what exactly happened in the second period, we had such a great first period, we came out with energy,” said Mansfield head coach Mike Balzarini. “Their first few shifts kind of set the tone, then we settled down and stuck to the gameplan. I can’t remember a time since I started here that we only had one shot on net in the period. But we had to kill three penalties in that second period, we played shorthanded for six minutes. That sort of gave us some life toward the end of the period and we had that late chance. Canton senior Jack Goyetch nearly doubled the Bulldogs’ lead two minutes into the final period when he redirected a shot from Jack Connelly but Mansfield sophomore Sean McCafferty made a terrific glove save. But the Bulldogs continued to put pressure as Goyetch and Mike Dadasis linked up before finding Bubba McNeice in front for a one-timer to make it 2-0. Canton cashed in on its fourth power play attempt with 9:20 left in the game. Mansfield won the faceoff clean straight back, but McNeice was first to the loose puck and fired a centering pass to Goyetch for a tap-in. The Hornets struck back just 17 seconds after Canton’s third goal. Fresh out of a timeout, Mansfield had a strong attacking zone possession before sophomore Joseph Troiano stepped into a loose puck and fired one into the back of the net. 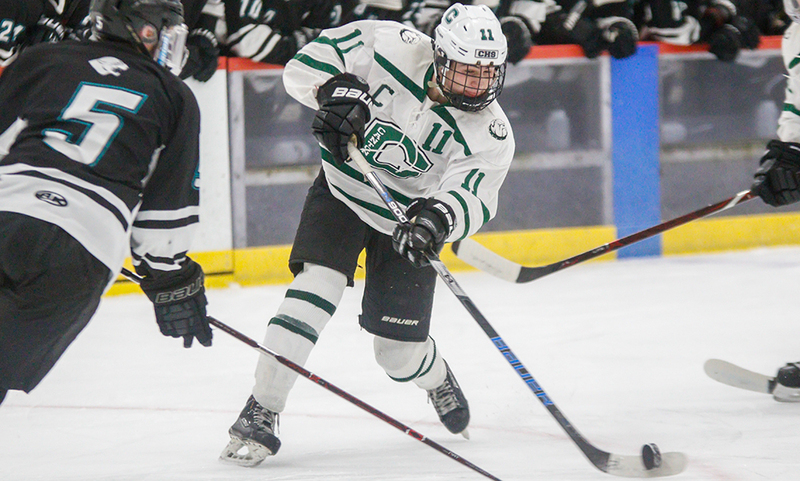 Canton boys hockey (7-0-0 Hockomock, 10-1-4 overall) is back in action on Wednesday when it hosts Franklin in a clash of Davenport and Kelley-Rex division champions. Mansfield (5-2-2, 7-5-4) will try to bounce back in a week when it travels to Brockton. ATTLEBORO, Mass. 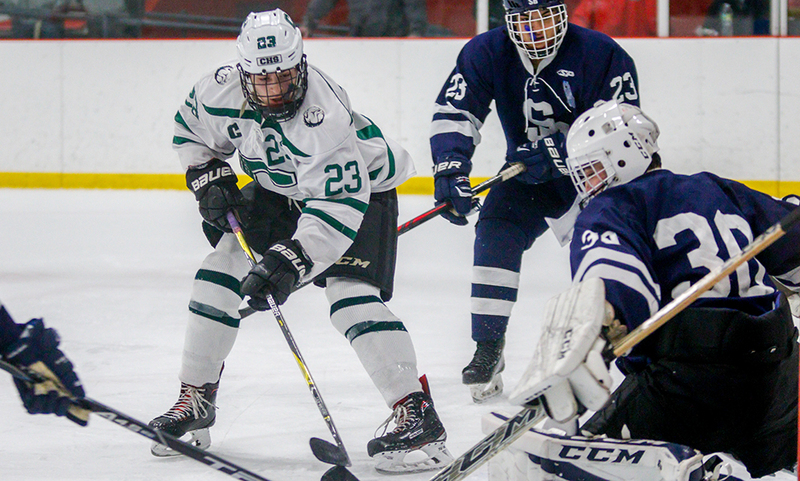 – Through two periods of play, the Canton boys hockey team had controlled the game, dictated the tempo, dominated time in the attacking zone, and had a large advantage in shots on goal. Despite all of that, the Bulldogs led just 1-0 through 30 minutes of play. But instead of letting North Attleboro hang around in the third period, Canton emphatically slammed the door shut with four goals in the final frame, picking up a 5-0 win over the Rocketeers in a clash of the Davenport’s top teams. “We didn’t really change anything in the third, we just kept trying to get pucks and bodies to the net,” said Canton head coach Brian Shuman. “We just focused on the next play. There wasn’t a better representation of our season so far than those first two periods. We had 40-something shots on net and only one goal, that’s how it’s been all season. Holding a 1-0 lead and a 39-3 advantage in shots entering the third period, the Bulldogs wasted little time adding to its lead. Despite starting with a 5-on-3 opportunity, Canton took a penalty just 23 seconds in to make it 4-on-3. North killed off the remaining 47 seconds to get a skater back to make it 4-on-4 but Canton cashed in just seconds later. After he first mishandled the pass across the blue line, senior Brad Murphy collected the puck off the boards, skated towards the center of the ice and unleashed a low wrist shot that found its way through traffic for a 2-0 lead. “If there’s one thing we’ve really been working on the last couple of weeks its been getting more shots from the defense,” Shuman said. “We don’t need the big slap shot to generate goal scoring chances. I thought our defense did a fabulous job of getting shots through. Brad Murphy…talk about improvement of generating offense from the blue line. He’s a four-year player for us but this year he’s playing at a whole new level and I was happy to see him get his first tonight. The goal seemed to give the visitors confidence as they were able to add to the lead just four minutes later. McNeice created the play from the beginning, knocking down and controlling a saucer pass as he entered the zone. He then dropped a pass right in front of goal that both Goyetch and Dadasis crashed the goal on. The puck popped free back to McNeice and he converted to make it 3-0. “When you can establish that forecheck and then get a turnover and attack right away, you can catch some teams,” Shuman said. “We tried to do that…get a turnover, get a forward caught down low, use the point and generate the offense from there and I thought we did a pretty good job of that tonight. Just a minute later, Murphy rifled another low shot through traffic that North goalie Ryan Warren (52 saves) turned away with a pad save but Nolte latched onto the rebound and roofed his shot for a 4-0 lead. With less than a minute to play, Canton put an exclamation point on the win when Goyetch tipped in a shot from Lehane from the blue line for the Dogs’ fifth goal. Canton established control in the opening period, keeping the puck in its attacking zone for the majority of play and outshooting Big Red 14-3. The Dogs had a couple of solid chances, including Ryan Nolte’s rebound bid off Nick Allen’s shot just a couple of minutes in, Mike Dadasis had his pass slide just ahead of the reach of both Bubba McNeice and Jack Goyetch at the midway point, and Nolte nearly pound McNeice with two minutes left but drew a tripping call on the play. The second period is where Canton really asserted itself, finishing with a 24-0 advantage in shots. Big Red only had two half chances in the period and neither were on frame thanks to an uptempo pressure defense from Canton. Despite the large margin in shots, the Dogs didn’t get a good scoring chance until they went on the power play with nine minutes left in the period. Less than a minute after going on the man advantage, Allen slid a pass along the blue line to sophomore Owen Lehane, who quickly fired a diagonal pass through the defense to Nolte. Nolte got a touch onto Johnny Hagan, who bored is chance from in close for a 1-0 lead. 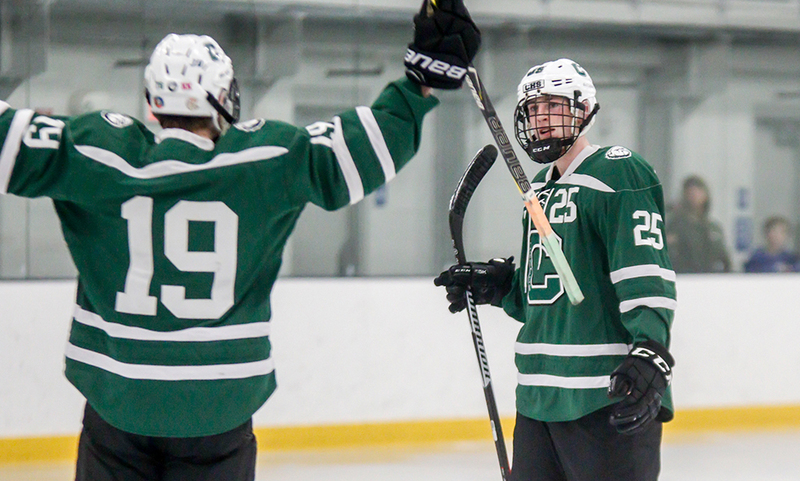 Canton boys hockey (5-0-0 Hockomock, 7-1-4 overall) returns to the New England Sports Village on Saturday in a non-league tilt against Bishop Feehan. North Attleboro (3-4-0, 8-6-0) will try to bounce back next Wednesday when it welcome Stoughton. FRANKLIN, Mass. – Two good bounces turned into two goals for Franklin, one for Dan Magazu in the second period and one for Brendan O’Rielly in third, and senior netminder Owen Ginley made 27 saves to make those goals stand up, as the Panthers pulled out a 2-0 victory over rival Canton in a non-league meeting on Friday night at Pirelli Veterans Arena. “We had a really bad practice yesterday after a big win Wednesday (4-3 against defending Div. 1 state champion St. Mary’s of Lynn) and I just didn’t know what to expect,” said Franklin coach Chris Spillane. The Bulldogs came out of the gates flying, outshooting Franklin 11-4 in the opening period and creating a number of scoring opportunities only to be denied by Ginley. Sophomore Chris Lavoie had the first good chance of the game nearly three minutes in when he was fed in front by junior winger Joe Robinson, but Ginley got his blocker on the shot. The puck deflected up off the post and out with several Bulldogs fans arguing that it had actually gone in. Five minutes later, Lavoie had another chance when he corralled a loose puck in the slot but it was saved and Robinson’s rebound was gloved. Franklin had its best chance of the period when Zac Falvey managed to knock the puck into the zone with his hand, barely staying onside in the process. He slipped a pass to senior Jeremy Miller alone in front but his shot slammed off the post. A couple minutes later, Miller found Falvey with a drop pass but again the Panthers were denied by the post. In between those chances, Canton junior Ryan Nolte found the perfect pass to spring senior Bubba McNeice behind the defense, but he was denied on the breakaway by Ginley. McNeice was stuffed a few minutes later with Jack McGrath clearing the rebound off the line and in the final seconds of the period Robinson had another chance but again the goalie was up to the task. Franklin came out much stronger in the second period and started to take control of the game. Within two minutes, the Panthers nearly created the opening goal when Miller forced a turnover with an important back-check in the defensive zone. He hit Falvey on the outlet, who then found Joe Lizzotte flying past the defense only for Canton goalie Quinn Gibbs (22 saves) to make the stick save. The deadlock was finally broken with 9:13 left in the second. O’Rielly carried the puck into the offensive zone and was met just outside the left circle by two Canton defensemen. The puck squirted free and Magazu skated onto it all alone. He cut across the crease and lifted a backhand over Gibbs’ pad for a 1-0 lead. Franklin doubled its lead early in the third period thanks to another friendly deflection. Luke Downie battled along the nearside boards to sweep the puck back to the point and retain possession. Tom Trasker lined up a slapshot that kicked off the skate of a defenseman right to O’Rielly, who took a second before wristing a shot past Gibbs. Canton stepped up its intensity in the closing minutes, desperately searching a goal that would get the Bulldogs back in the game. Nolte had the best chance on a power play with five minutes left. He tipped a shot from the point right in front of Ginley, who made the first stop, and then had the rebound come right back to his stick only for Ginley to throw out a pad and stuff the chance on the post. Franklin (2-0) will travel to the Olympia Center in Springfield to face perennial Super 8 contender Pope Francis on Thursday. Canton (1-1-1) will host defending Div. 3 state champion Shrewsbury on Wednesday.